It was a few months ago that Ted Cruz attacked Donald Trump for having “New York values.” That went over pretty well in the sticks of Iowa and is the sort of insult that appeals to the rube voter. Now Cruz is in New York. After making his New York Values insult, Cruz said it wasn’t hard to figure out what it meant and that people in South Carolina knew what it meant. Now, despite it not being hard to figure out, Ted is spinning his definition as something directed toward New York big city liberals. No matter how terrible he views New York, he wants some of its 90 delegates. Cruz is handing this awkwardness about as well as someone who just asked a non-pregnant woman when is her baby due. Cruz visited the Bronx on Wednesday where he might have been greeted a bit nicer than Hitler would have been walking through a Warsaw Ghetto. Cruz was shouted at in a variety of languages as he was met by protesters. One stated “Ted Cruz has no business being in the Bronx, this is an immigrant community,” He had to cancel a visit to a Bronx high school Thursday as students threatened to walk out. Many in the five boroughs are telling Ted what he can do with his photo op. Too bad there’s not a primary in Canada. John Kasich stand no chance to win in New York, but he does know how to experience the city. Ohio’s governor visited Mike’s Deli in the Bronx and got food busy. He ate two plates of spaghetti bolognese. That would have been lunch for me but Kasich didn’t stop there. Next he tackled a sandwich called the Yankee Stadium big boy which contains mozzarella and four types of meat. The sandwich was huge. He then had some pasta fagioli and a little red wine. Kasich left the deli wiping sweat off his brow. If he’s anything like me he went into a food coma and needed a nap later. Damn. Now I’m hungry. Cruz also visited Mike’s Deli on Wednesday where he was told how to eat a sandwich. Apparently it’s bad luck to place it upside down (I always do that whether it’s a sandwich or a burger. Uh Oh!). 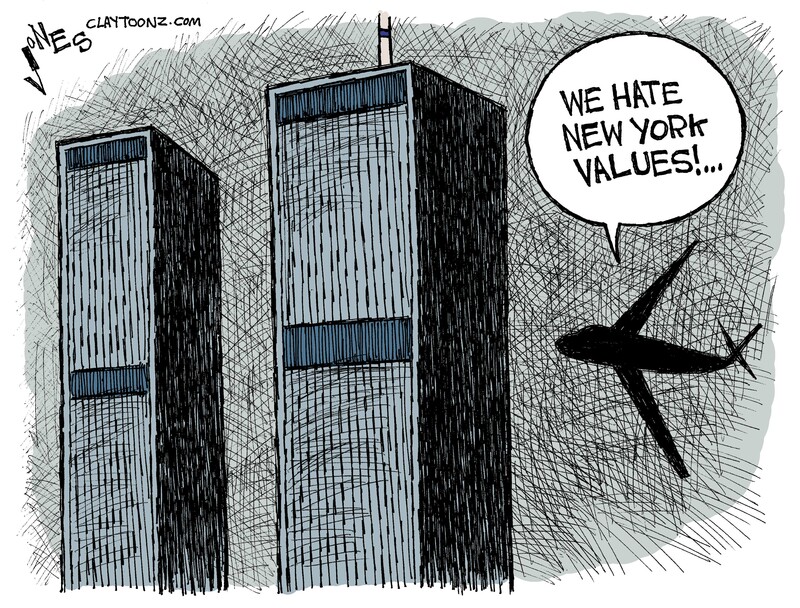 When Cruz made his remark on New York Values we had yet had a primary. 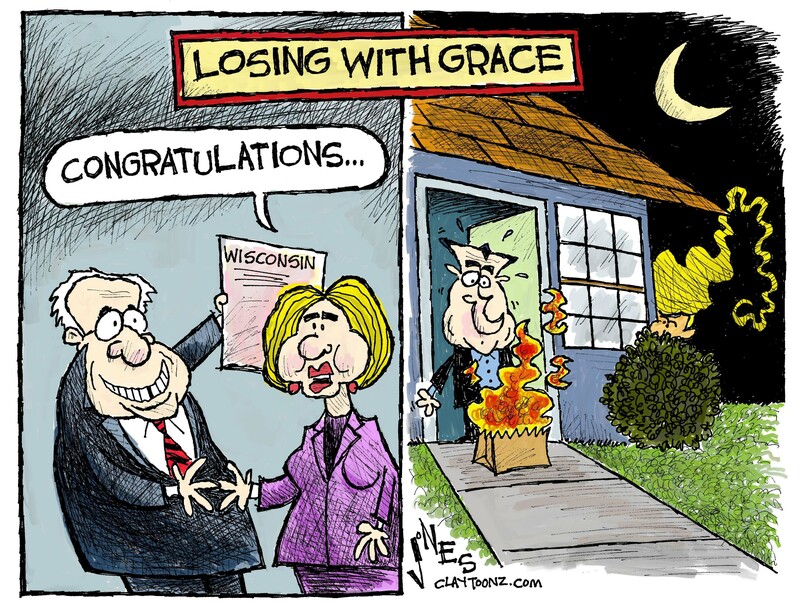 Since then he lost big where he was supposed to win, the South. Evangelicals voted for Trump. How about that, Ted? 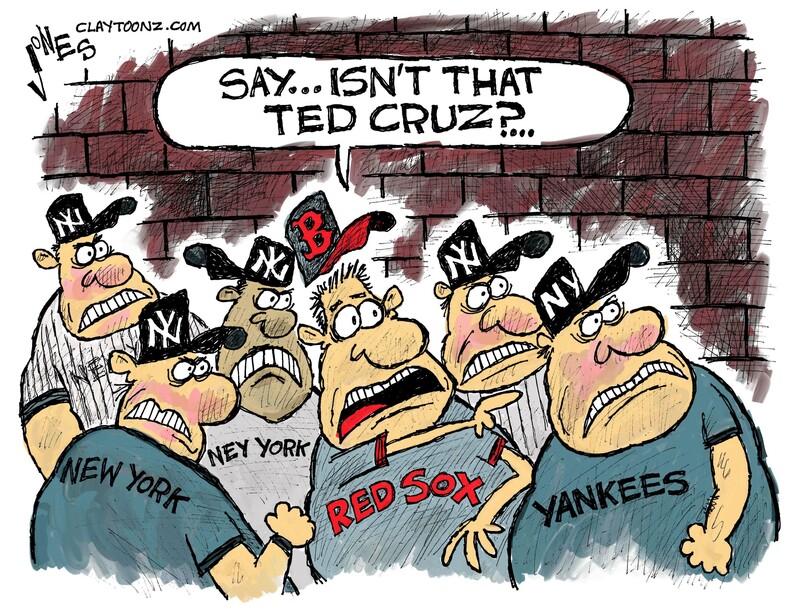 All of a sudden Cruz needs New York. If Cruz had done better in the South he wouldn’t even be campaigning in New York today. But hey, Ted, if you can make it there you can make it anywhere. You ain’t gonna make it. There’s four more boroughs in the city and I think I can speak for everyone that you should visit each of them. The New York Daily News splashed across their front page “Take the FU train, Ted.” Good idea. Don’t expect to use tokens. Leave it to Ted Cruz to make Donald Trump look and sound like a statesman. What happens if Cruz becomes president? Will he make Kim Jong Un look like Churchill? In an attempt to defuse Trump’s attack on his eligibility to be president, since he was born in Canada, Ted Cruz warned Republican voters that Trump has “New York values.” This guy who wants to lead the United States has totally disrespected one of the states and its entire population. It seems if someone’s to be warned about something being from New York, that something is salsa or Barbecue. Not a person. And sure, half of the country hates the Yankees. But to hate a person because of where they’re from? While Ted tells us what an expert he is on the Constitution, he needs to learn up on geography. New York is in the United States. Calgary is not. If there’s only one city that can take a hit like it did on 9/11, and grow stronger, that city is New York City. New York is tough. New York is multicultural. New York is a melting pot. You can stereotype any city or state and each and every single one is more complex than a black and white stigma. New York values embodies fire fighters rushing up the stairs of a building that can fall down any second so they can save as many lives as possible. 343 fire fighters, 60 policemen and eight medics died instantly when those buildings fell down on September 11, 2001. 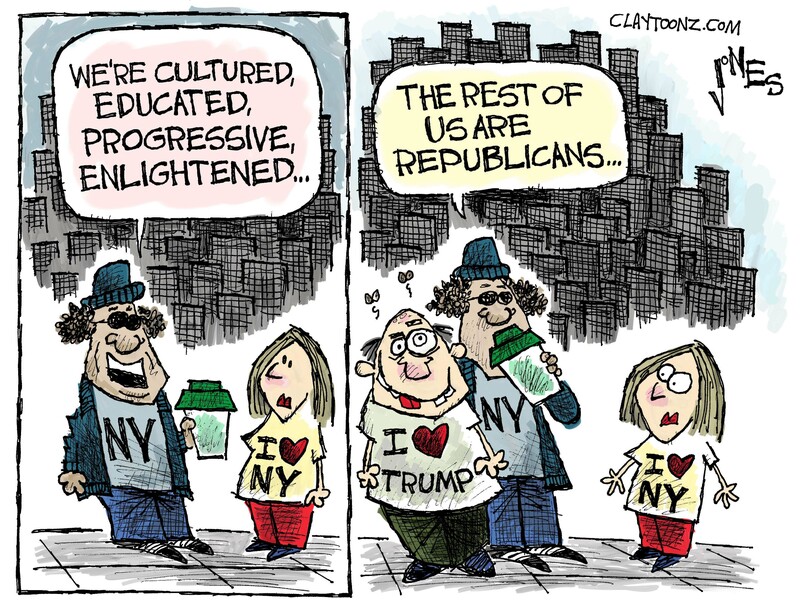 New York values. Ted Cruz could use some.